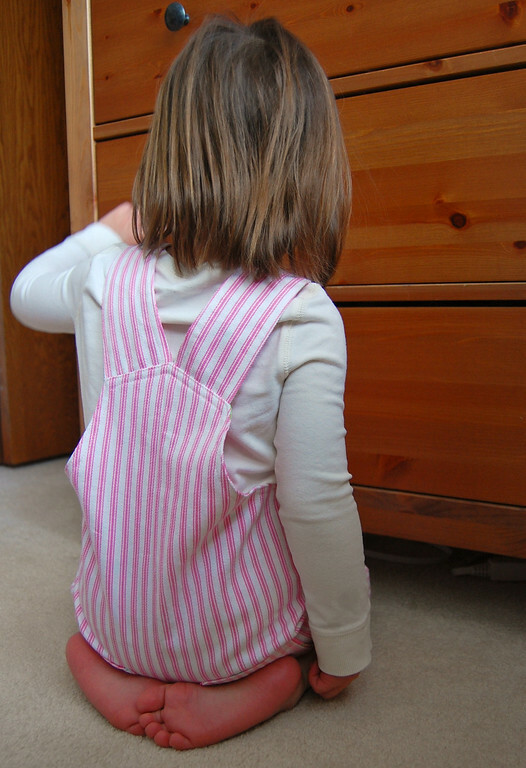 Today we're going to adapt the basic shortall for girls. If you're a regular reader of ikatbag, you might have noticed that recent tutorials are skewing towards process rather than product. It's something I like talking about, and something you asked for, so maybe a win-win for both of us. 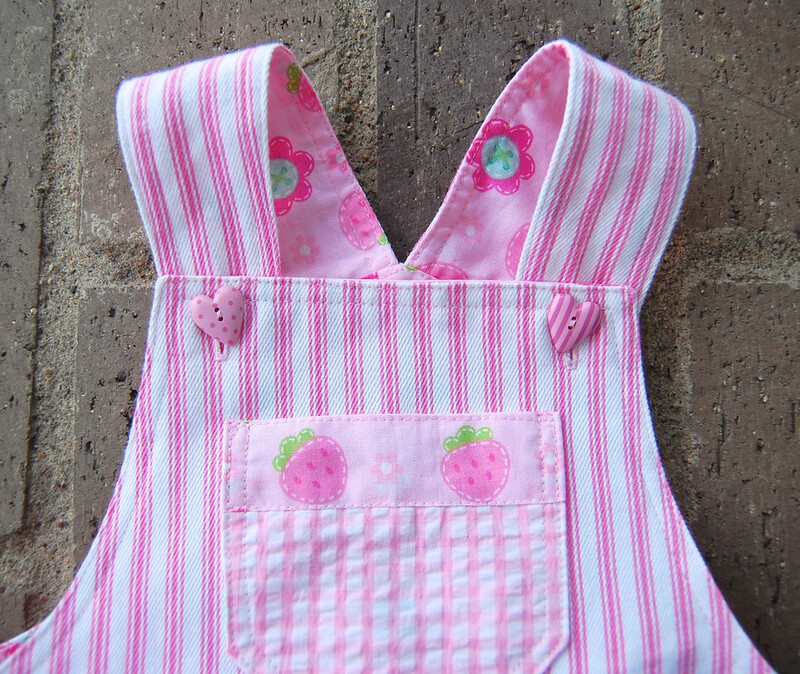 This pink-overload version uses three pink fabrics: a pink ticking on the outside and a pink print cotton for the facing. You can find ticking in the utility/home-dec/upholstery section of fabric stores. and the lining for the inset pockets. and the waistband. On hindsight, I should also have edged the top edge of the waistband. The overall look: sweet, mild, low-contrast pink. Same bodice - but the pants have morphed into an A-line skirt. 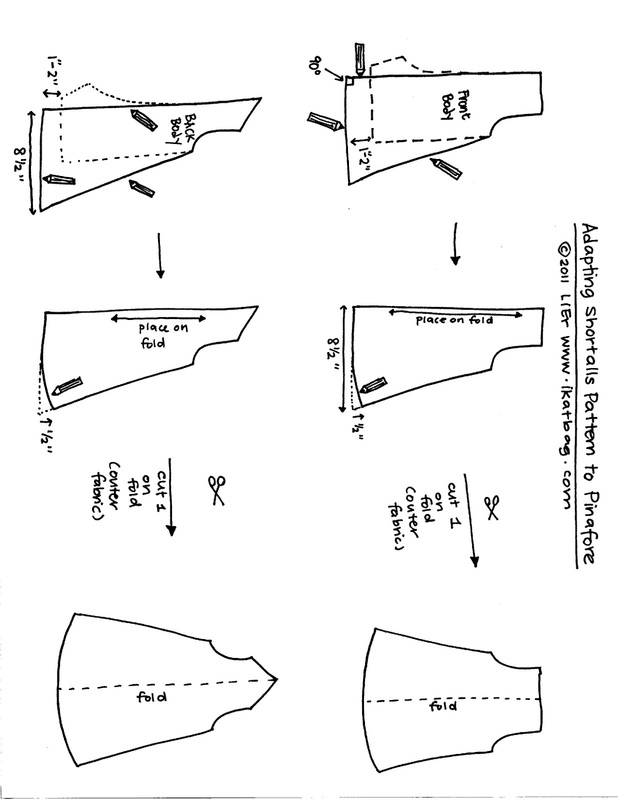 You can lower the hem even further than 2" if you prefer. 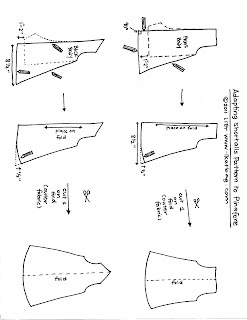 Without the crotch, the center line of the pinafore templates is completely vertical, so the templates can be laid out on the fold of the fabric, and the front and back body pieces cut out whole. the side seams will be slightly more flared now. However, the lower edge of the facing (i.e. 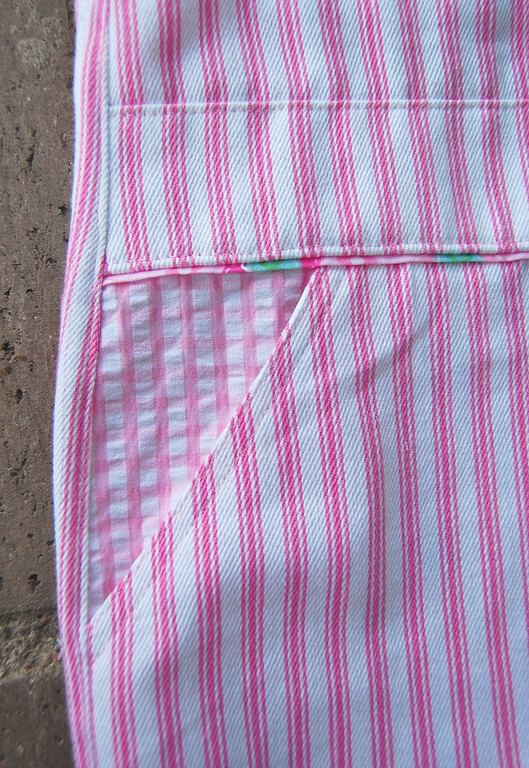 its hem), remains the same as in the original shortall pattern. which was also used for the pockets. Purely for interest, the bib pocket and hip pockets have their outer layers and linings reversed. 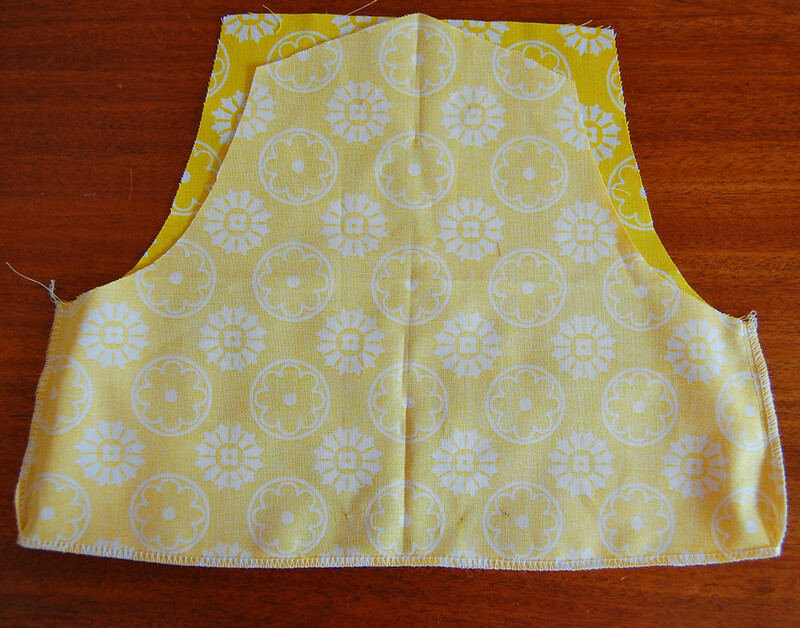 Instructions to make faux-flap patch pockets like these can be found here. 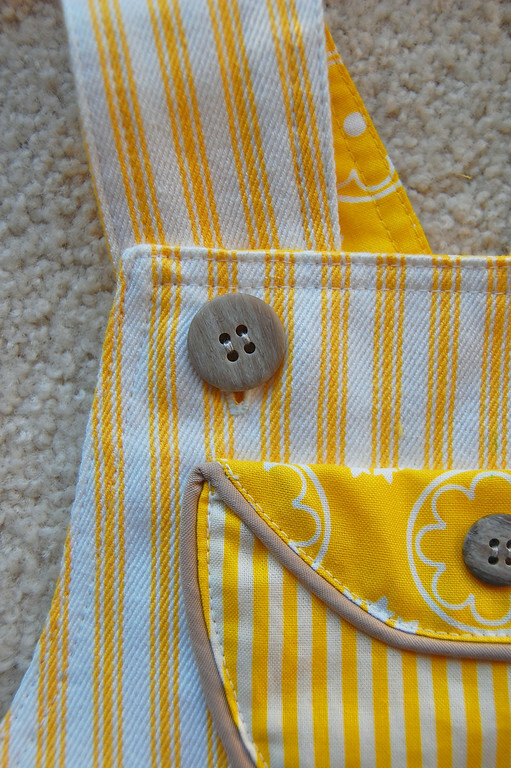 Because there was a lot of yellow, I added grey/taupe piping throughout the dress and grey/taupe buttons for a second color. 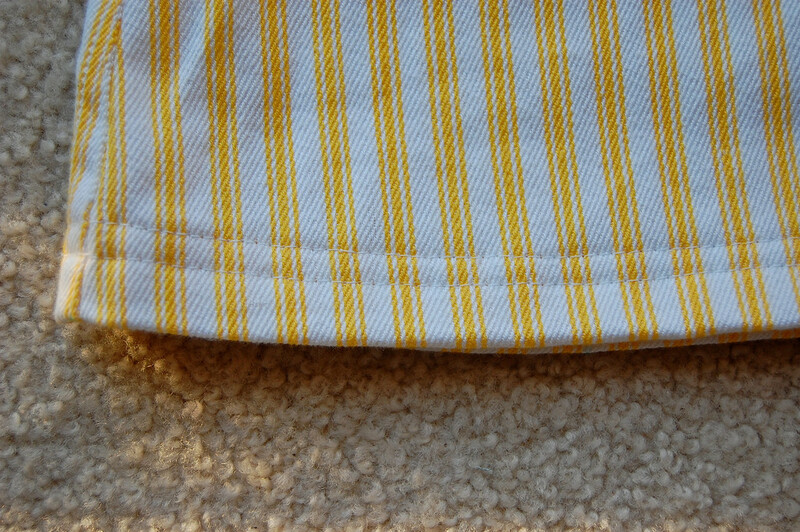 The bottom hem was finished simply by folding it up and top-stitching on the outside. The overall look: modern, high contrast, lots of pop with just two colors. I want to point out that the lining fabrics of both the pink and yellow outfits above are quilting cotton. See- I do use them in my garments! I know I've gone on and on about not using quilting cotton for garments and I hope you're not frightened off sewing forever. Please keep using and enjoying funky prints if you love them. And quilting cotton if you love it. But I meant that if the opportunity presents itself, also try linen. Or twill. Or chambray. Or corduroy. Or poplin. Or knit interlock. I think you might just love the difference it makes. you have such a good eye for pairing fabrics. I like the modifications thanks! the dress is a little more modest on my little one I can not get the shorts just right the hug to tight on the rear end. 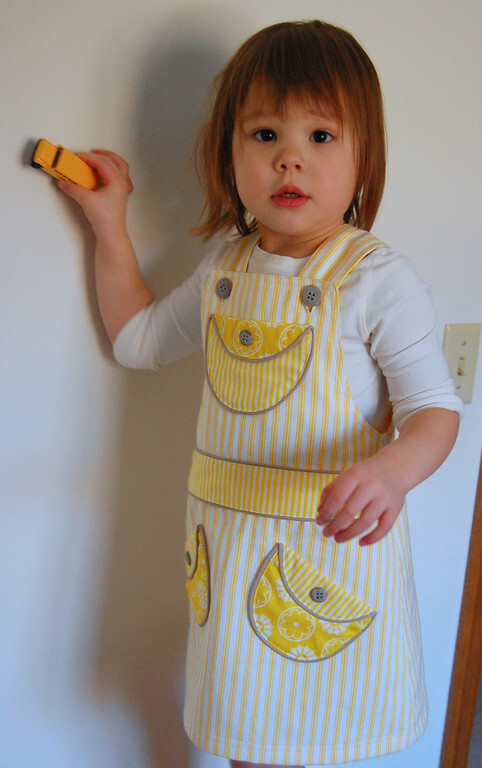 I love the yellow pinafore! And your use of grey has me looking at that color in an entirely new way. I haven't touched my sewing machine in ages, apart from serging some flannel to make simple handkerchiefs for the kiddos. Which doesn't really count as sewing, in my mind. I love the yellow. The front looks like a big smily face. 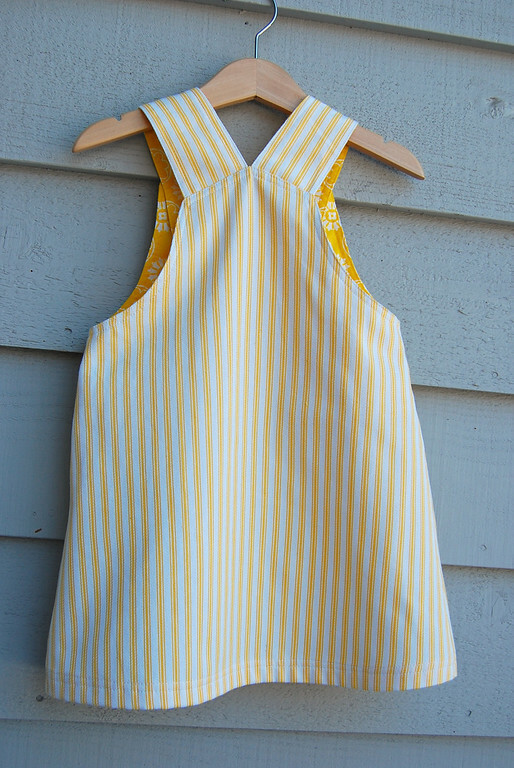 I've been dying to sew kiddo clothes from ticking lately (I caught that brainwave! Funny how that works, isn't it? ), but not having any on hand has kind of put a damper on my enthusiasm. I'm thinking it would be fun to do coordinating ones for my girl and boy (ages 4 and 1). The pinafore version is really cute. I thoroughly enjoy reading your blog. I checked out the Stringer book from the library. Thanks for the recommendation. I must buy one. My goal for this year is to try making a pattern. Question about the occassional use of quilting cottons for apparel: Since it is so thin, should it be lined and if so, with what? Thanks for all that you do. Many blessings to you. Anonymous: If I were sewing this pinafore/overalls in quilting cotton, I'd face it with something of at least the same weight - so another quilting cotton, or a light twill to give it some weight. I wouldn't make the facing out of something very much heavier like denim. 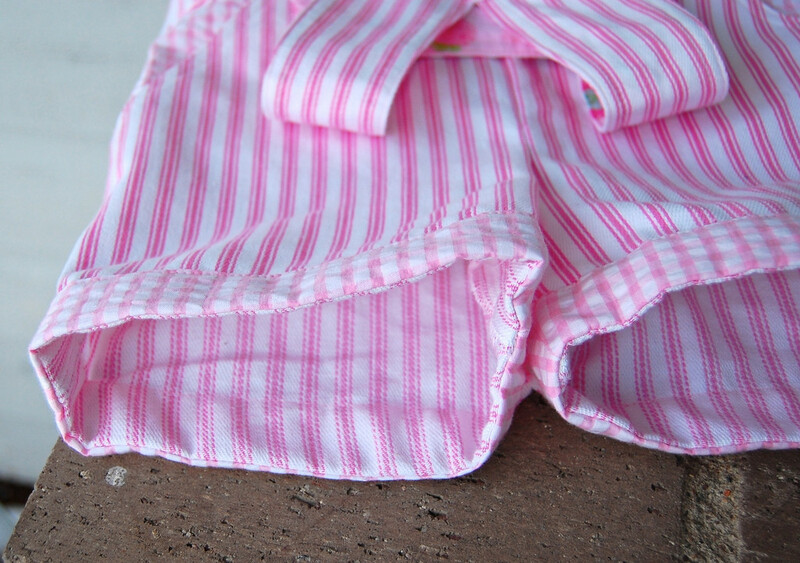 The facing is usually better lighter or equal to the outer fabric. I am excited that I discovered your blog, I have been reading back through the archives and feel like I need more time to soak it all in. 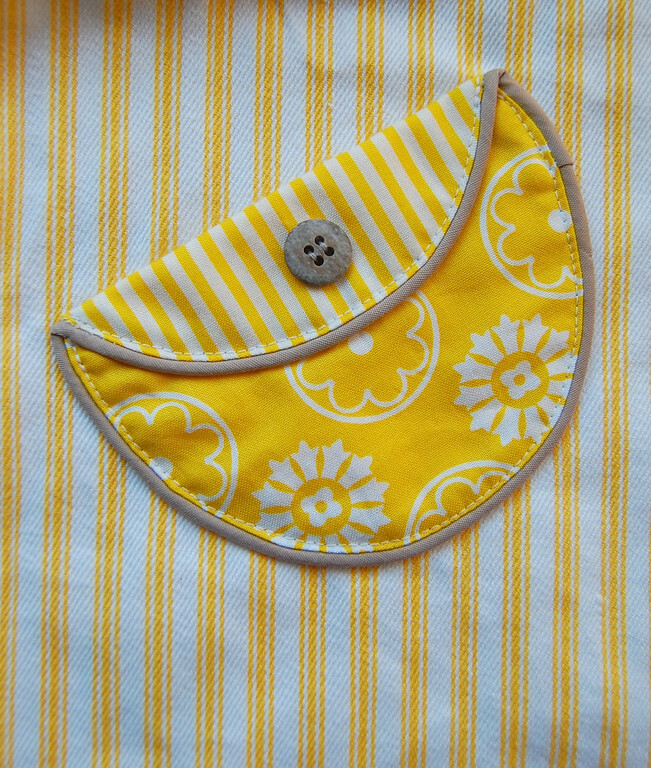 I am especially excited about the fabric buckets and the pocket tutorials, so fun. These are gorgeous! love all the adaptations! that yellow one - I love it! I'm impressed with your output here, that you MADE all of these to show us how it's done. Thanks so much for another great tutorial. I'm so glad I found your blog last month. I'm learning a lot and am so appreciative of you sharing your knowledge with all of us. 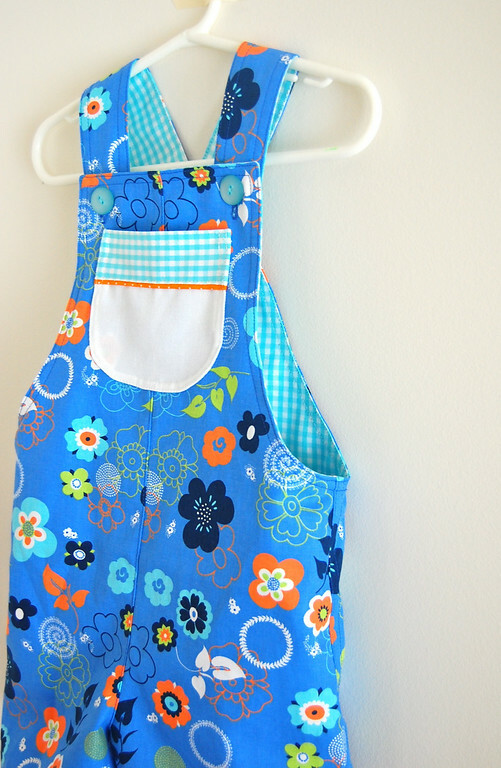 Oh, that pinafore is PRECIOUS! I love the pockets and the waistband. I will be making that for sure! 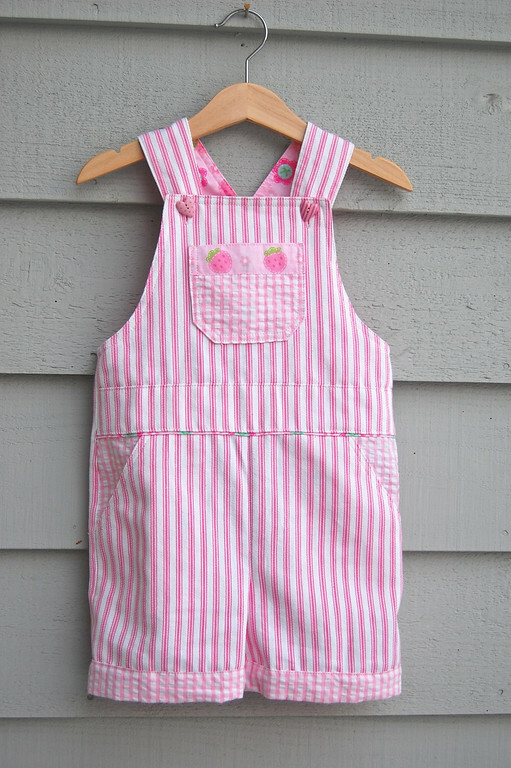 I would love to make the pink adaptation of these overalls. It doesn't seem like you posted a specific tutorial. 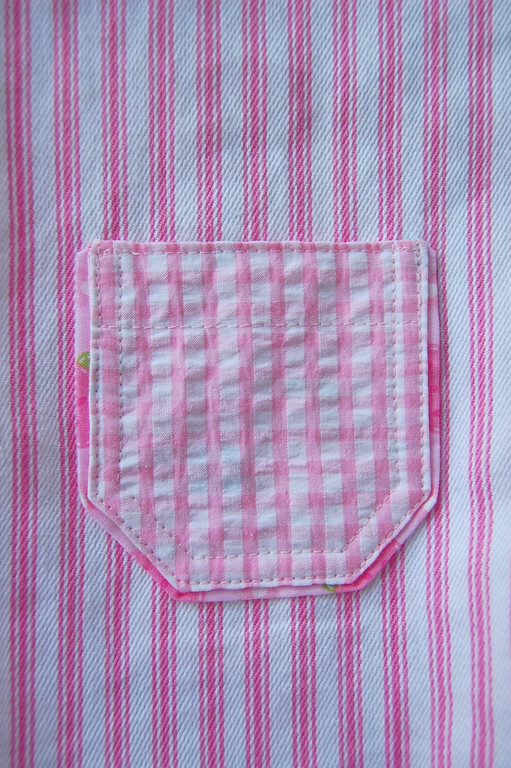 Do you have instructions anywhere for how to do the inset pockets? Try the original overall post for the tutorial. 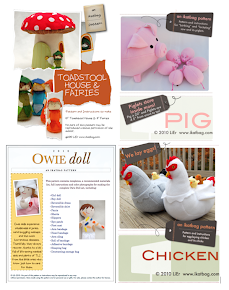 Alternatively, you can find a link to all the pocket tutorials (there are 26 different ones) in the sidebar. 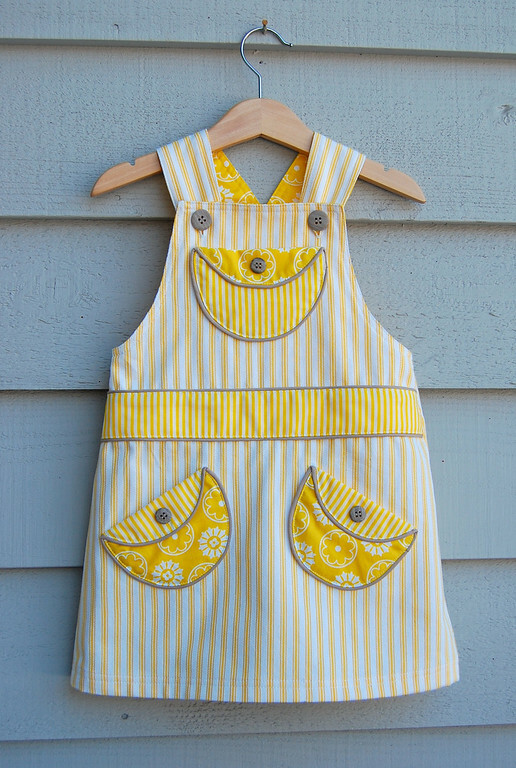 wow, this is totally adorable (not that i will actually be able to make one of these yet, just learnt how to sew in september!). I love your blog and I love your ideas! Thank you very much for sharing. Hi..You have such an artistic eye for colours! All your designs and patterns are so adorable and I love the way you write too.. You are my online-guru for sewing.. 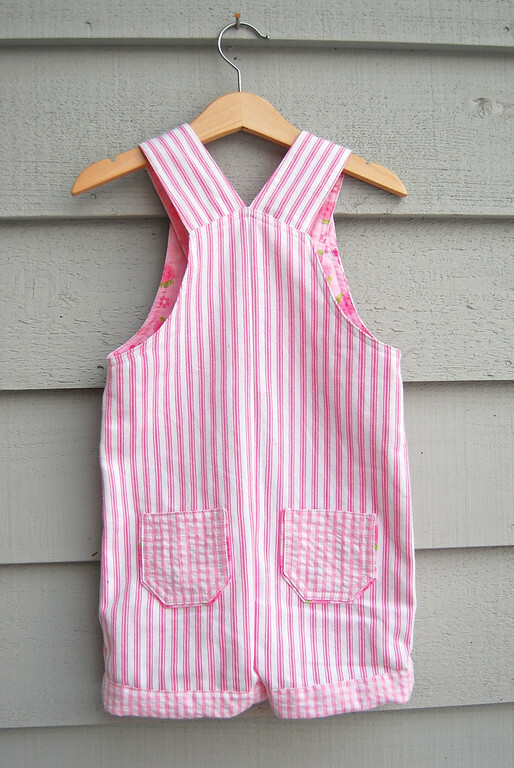 I'm a complete beginner to sewing which started off as a hobby (with a pillow case dress and a couple of A-line dresses for my 15 month old daughter) and now I'm hooked on..I think I might have to quit my full time job as a consultant :) I have wanted to make this type of pinafore from the last 3 months! Thank you very much for all the detailed instructions. How sweet! Re: quilting cottons, I use them a lot for my toddler, simply because my tiny town has 2 quilt-fabric shops and 1 dance-fabric shops and *0* dress-fabric shops, and I just can't make myself dress a child in sparkly organza and neon lycra every day. 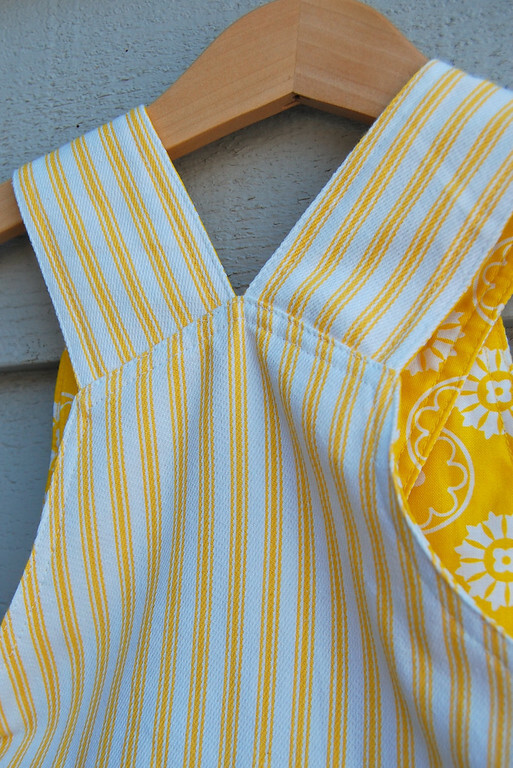 I have found the quilting cottons light, breathable, easy to work with and plenty durable for the relatively short time the garments get worn before little miss grows out of them. I generally line the bodice for durability and seam-free insides, but I have used one layer of quilting cotton for pants many times and never had any rips. 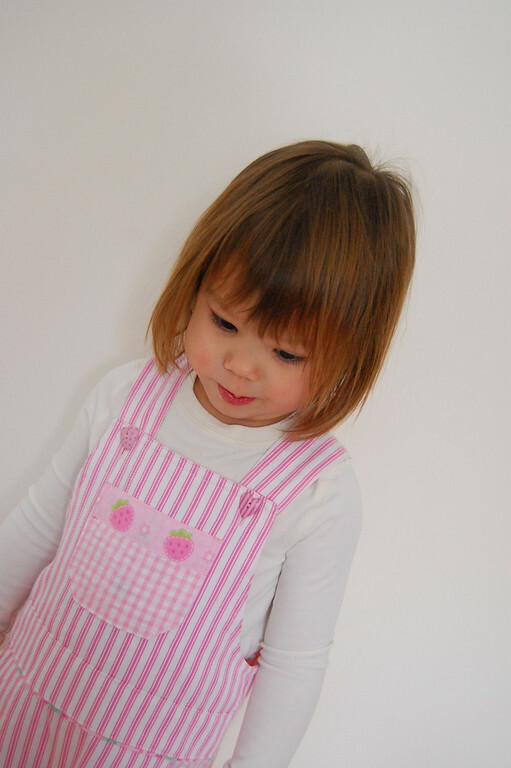 Love the pinafore and the overalls. 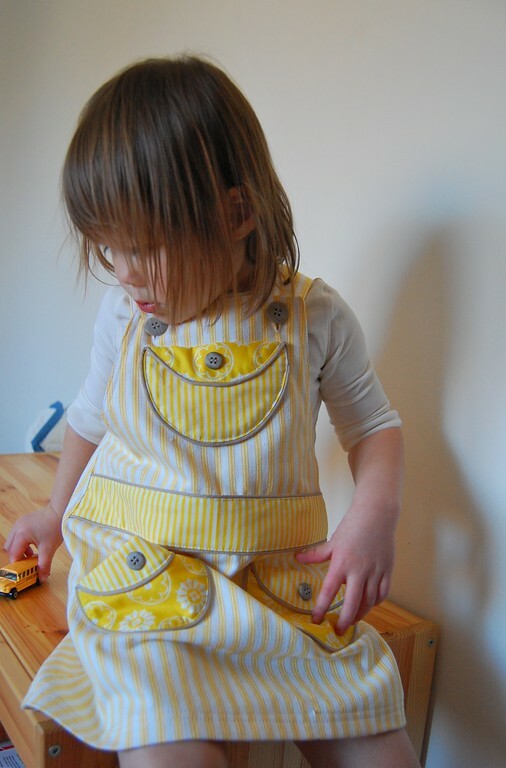 Both are wonderful (am trying to do the overalls now) wondered if you might be able to tell us the name of the yellow striped fabric that you used for the pinafore as its heavenly. Jo Booth: it's yellow ticking. It's home-dec weight. I often find it in the utility fabric (not apparel fabric and not quilting) section. Comes in other colors, too, most commonly dark blue and red. Awesome stuff, Thanks for the reply :) Will post up how my overalls go once I'm done (such a slow, slow sewer). Very cute! Did I miss somewhere what size these are? I know I must be missing reading something here, but what size is the pattern for the pinafore dress. Michele: Based on the date this post was written, I'd say a 3-year-old. That was how old Kate was, anyway, at the time. Thank you so much for the pattern. I am going to adapt it for an 18 month old boy. I am going to measure one in the store for sizing since I dont have him to measure. If I get brave I may also.try it out in a knit, making the appropriate adjustments. I'll let you know how it works out. Love it enough that I am thinking of making his older sister a pinafore perhaps both in seersucker. Again thank you for such a nice well designed pattern. Maybe I missed it, but I cannot find the size of this pattern. Can you tell me what size it will fit. It fit my (then) 3-year-old. Anonymous: the jumper - the link is in two places: the sentence just above the sketches, and in the first sentence of this post. 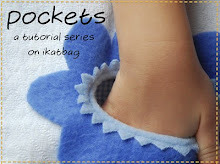 The pockets: there is a link in my blog sidebar to the entire series of pockets - look for "The Pocket Tutorials and click on the link to take you to the post with the master list. Search for the kinds of pockets you want in that master list. How can i download this pattern ? I love it . 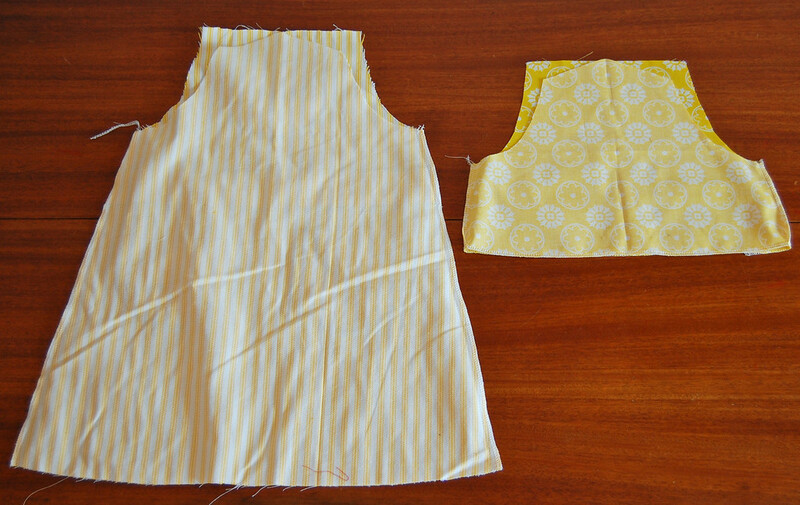 Diane: partway down this post is a thumbnail of some sketches showing how to adapt the basic overall pattern to the pinafore pattern. If you click on that thumbnail, it will link you to a larger image you can print out (or save as a screenshot to print out). For the basic overall pattern and templates, look at the sentence just above that thumbnail. The link is in it.